09.27.2006 - Here's a nice blurry shot of my friend Tim and I with some armadillos that we caught today. They've been very active lately, digging large burrows under homes. Most armadillos that I deal with tend to dig underneath homes. However, in this particular case, the armadillos were digging under a deck. They must have moved about 500 square feet of dirt in this case. The mound of sand/dirt outside the tunnel was simply huge. We had to work to climb over it. The homeowner didn't want the armadillos because they removed so much dirt out from under the deck, and the floorboards were sagging. The animals were also driving the dogs crazy, and the dirt covered much of the landscaping. Tim and I set three traps, in the secret manner that we do, and we caught them. 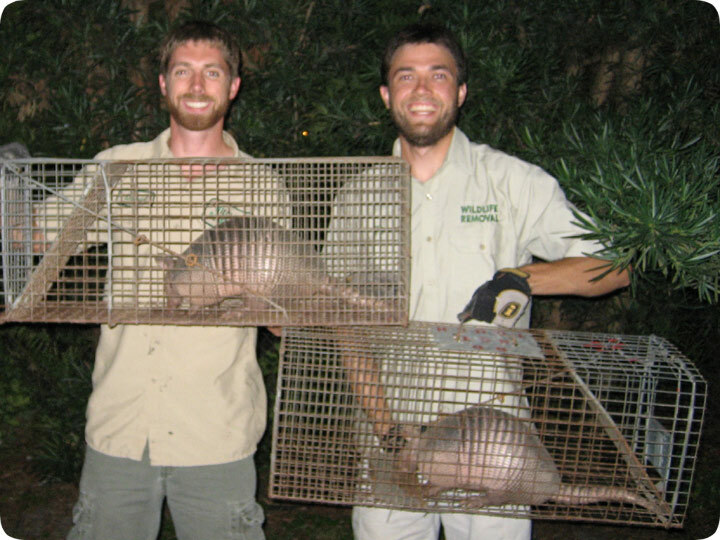 Trapping and removal is really the best method of armadillo control in Florida. There's no other good tactics. If the homeowner had simply tried to fill the hole in, they'd have dug it right back up again. There are no effective repellents to keep them away. This case was rare, in that both armadillos were caught on the same night at the same site. I believe it may have been a mating pair, but I'm not sure. The homeowner sure thought so. I don't know all of the specifics of armadillo reproduction. I do know that the embryo always splits into four, creating four identical twins. I also recall reading at some point that armadillos employ delayed fertilization. I've also read that, due to the shell, they actually mate missionary-style. I have not verified this with my own eyes. Okay, I just read up on it, and sometimes the implantation of the fertilized egg is delayed. Gestation is about five months. So we removed the armadillos and at the end of the day, set the self-timer on the camera, and took the photo. Alas, the camera did not focus on us, so we are blurry. But that's okay. Pretend that you are an armadillo. Your vision is so bad, that this is what all things look like to you. Now, go outside and dig up a grub. I know you have the urge.